What Can Wearables Do for Your Health Club Members? The latest generation of wearable fitness trackers are presenting data in a more meaningful way. And your club can leverage that data for members. You may think you are familiar with wearables, those tracking devices that nearly everyone and their mother-in-law seem to be sporting on their wrists these days. But do you really understand what they—and the mobile fitness apps that work with them—can do for you, your members, and your club? You’re probably aware that smartwatches, such as Fitbit, Garmin, Jawbone, and the Apple Watch, can count a user’s stops and track the distance they travel. Some can monitor a person’s heart rate, and, using global positioning system (GPS) technology, can map walks, runs, and other activities, generating a wealth of data about their fitness level—or lack thereof. But if that is all you know, then you may be missing out. Depending on a wearable/app package to do little more than amass data is a thing of the past. Using them to effect lifestyle change—now that’s the wave of the future. Think of it as “Wearables 2.0”. In his capacity with Active Wellness, Rucker oversees the digital strategies for the company’s 10 Active Sports Clubs, as well as its corporate wellness partners. The presentation, led by Rucker, was designed to help club operators maximize the potential of these devices, and the need for it quickly became apparent. When polled, 63% of the participants said they were exploring the use of wearables; 20% indicated that they were using wearables via a club-based program; and 10% said they were collecting data from them. In case you missed this informative and illuminating event, CBI spoke with Rucker to find out more about how your club can use these devices to effect real behavior change, and, in the process, have a positive impact on virtually every aspect of your business. Rucker starts by pointing out that, slow as the industry may have been, it’s finally begun to acknowledge and embrace this technology. To illustrate his point, Rucker references an intriguing item that, while it may never have a place inside a club, offers valuable lessons nonetheless—the Dreem headband, made by Rythm. 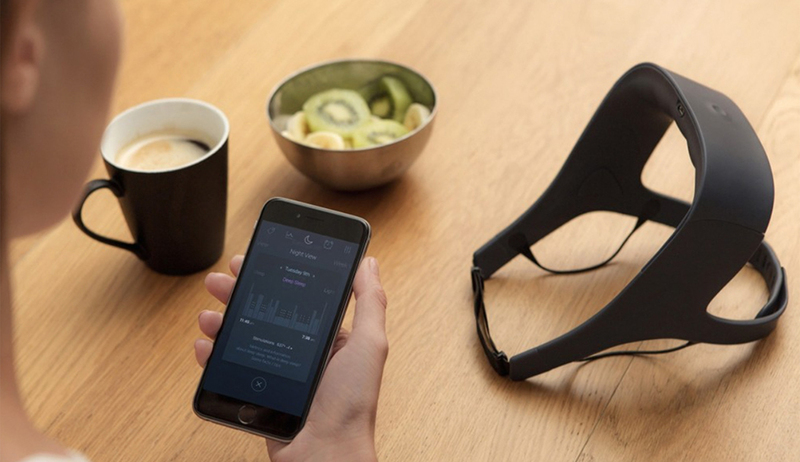 This device does much more than just monitor the duration of one’s sleep. Its sensors can detect whether you’re in a deep or light sleep, and create stimuli that help you remain in deep sleep longer. The result: You wake up feeling more refreshed. To Rucker, that’s what Wearables 2.0 is all about—not simply tracking data, but using it to improve the user’s experience and health. Another somewhat futuristic example of this sort of high-tech monitoring is clothing made by Athos that makes use of integrated sensors. They can analyze the effort of various muscles, offering what the firm calls “an unprecedented level of insight” into a workout. “Earlier devices might have told you, ‘You walked 10,000 steps—great job!’ Now, though, by employing smart clothing, trainers can analyze someone’s form, and determine, for example, if their left shoulder isn’t engaging as much as their right one. Now, trainers can offer feedback and make an adjustment in real time,” Rucker says. If smart clothing seems fascinating but a little bit intimidating—don’t worry! Fortunately, you don’t have to start there, and, chances are, you shouldn’t. The key to progress is choosing the wearable/app package that’s right for your club and members. To make the appropriate choice, you have to consider how sophisticated your members are; whether they’re comfortable with technology; what technology could do for them; and, importantly, how much it would cost. Wearables that are basically pedometers, tracking steps and calories burned, may work well if a large portion of your members already own and use them. If, for example, you want to get a group of seniors to walk and move more, then these relatively straightforward devices may be adequate. However, if you have a group of clients who tend to “crave” more intense exercise, then a device with a heart-rate monitor might be a better option. Typically, the ones that make use of a chest strap are the most accurate. Whatever type of equipment you choose, you’re going to have to think about presenting the data collected in a meaningful way—presenting it in a format and context that helps your members reach their goals. You could, for example, use wearable/app technology to monitor heart-rate readings in a small group setting, such as an indoor cycling class. Another wearable option that you may not have considered is a smartphone coupled with a mobile fitness app. A plethora of apps—both free and paid—are available to track exercise and other forms of physical activity, for all purposes transforming a smartphone into a wearable. One example: the mobile platform offered by Netpulse integrates with a number of popular apps and fitness trackers, such as Nike+, Fitbit, and MapMyRun, to consolidate a club member’s fitness data in one convenient spot. Some of these apps can utilize a smartphone’s internal tracking sensors and, so, don’t require a separate tracking device to operate. This allows some users to employ a smartphone as their sole fitness tracker. The fact that the Netpulse platform can consolidate data from numerous sources—e.g., wearables, apps, and club cardio machines—on one dashboard gives members a more holistic view of their fitness activity. That said, there are downsides to using smartphones as fitness trackers, he says. For example, today’s phones are increasing in size, especially as they morph into personal entertainment devices. An oversized phone may not be portable or comfortable enough for a walk or a jog. Fitness tracking also can deplete a phone’s battery, requiring multiple charges over the course of a day. That could make the five-to-seven-day battery life of a typical smartwatch tracker seem luxurious. And, Rucker notes, if you have a more discerning clientele, a mobile app and a smartphone might not offer enough functionality to keep your members engaged and happy. Regardless of which device you choose, keep Rucker’s bottom-line advice in mind: Make sure that the wearable/app combo—or, for that matter, any technology you utilize—isn’t a substitute for the support that you provide to your members. “Any technology should augment the member experience—not be the member experience,” he warns. If this advice on choosing wearable devices sounds a bit wishy-washy, that’s because, today, in large part, the device has become less important than the software that drives it. Today, software is the star. Connecting with your members via a wearable—whether it’s a smartwatch or a smartphone—permits you to create additional touch points, building bridges between the user and the club. Those touch points might, for instance, come in the form of a push notification from a mobile app, or a buzzing smartwatch to remind a member to check in to the club. All of the data collected can be used to create games and challenges, and, subsequently, reward users, Rucker points out. The key here is to use the right kind of rewards and incentives. “What we’ve learned is that variable rewards are better than big prizes,” he says. While big prizes may reward the top one or two performers—members you’d probably retain anyway—offering multiple, smaller rewards along the way allows you to recognize and satisfy more individuals, maximizing the ROI on your investment in Wearables 2.0. Whether it involves technology or not, the club member experience is—and always will be—personal.